Fr Charles Briggs regularly poaches my parishioners for his 7.30pm usus antiquior Low Mass on a Friday evening and I often poach his parishioners for my Masses at Blackfen. We are cool about this in the spirit of inter-parish collaboration. So I dropped in to his Mass this evening before we both went out for a late supper of fish and chips. 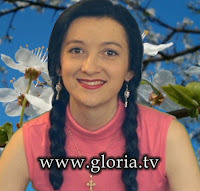 Fr Briggs is an assiduous follower of the compulsive source of Catholic information which is Gloria TV news. Presented by the lovely Doina Buzut (with whom, I am proud to say, I am friends on Facebook) this is a source of pleasantly presented but hard-hitting news items from the Catholic world. Today's news has a particular focus on England with an item at the beginning reporting on Cardinal Cormac Murphy-O'Connor's comments on the Holy Father's proposals for Anglicans to come into full communion with the Catholic Church.